The lucky few had tickets to the screening, but most were there to just witness the spectacle, which included Daleks roaming the red carpet. For Gary Luz, a lifelong fan of the long-running series, this was a moment to remember. "I've flown all the way from Chicago to be here today," he said over the sound of the crowds. "I'm on cloud nine right now. This is one of those moments where people ask 'Where were you on this date?' and I can say 'I was there, I was there at the premiere of season eight and I was this close to Jenna Coleman.' But really I'm here for Capaldi. I've been watching his career since Local Hero, all through The Thick of It and Three Musketeers and now here. "He's going to be brilliant. I really want a darker Doctor. We've been too whimsical the last series and we need the Doctor turned on his head. I think it's going to be amazing and more." As the screening began, the audience of devoted fans shrieked and whooped with excitement at the prospect of seeing the new Doctor, one that both Capaldi and the show's writer and director, Steven Moffat, has promised would be darker than Matt Smith's version of the character. They were not disappointed. Opening in a world reminiscent of Victorian London, though with the addition of dinosaurs, aliens and cyborgs, the 80-minute episode pleased the fans with wry references to the show's history. "I need clothes … a long woolly scarf," the Doctor quips at one point, while also introducing a character grappling with questions of identity. The lack of any romantic tension between the Doctor and his assistant Clara, played by Coleman, was also made clear. "Clara, I'm not your boyfriend," he tells her. Speaking after the screening, Capaldi said it had been "terrifying and wonderful" won set to step onto the set for the first time. As Moffat's first choice for the role, Capaldi's audition had been so secret it was held in Moffat's own house, with the actor admitting at the time he had no idea he was the only person who would be auditioning. He said: "I felt a great responsibility, responsibility because I know how important the show is to people, but I thought: it doesn't get better than this. I realised there isn't a specific actor that I modelled myself on, but I was actually brought up on Doctor Who, so William Hartnell and Patrick Troughton, Jon Pertwee, Tom Baker and Peter Davison, they are sort of in me and taught me how to act because I spent a lot of time trying to be them. So I suddenly realised that when I was out in the world, trying to be an actor, I was constantly channelling those guys." A lot of thought had gone into his look as the Doctor, he said, including experimenting with several outfits – "lots of scarves and floppy hats. Everyone wants you to wear a floppy hat" – before he settled on what he referred to as his stark look, a buttoned-up white shirt and sharp black coat. Capaldi also described how series eight of the revived Doctor Who, acknowledged as the longest r running science-fiction TV programme in the world, would build on a character with so much history and expectation weighing on him. "Having had the life he's had, the Doctor tor is always going to be haunted by his past. This series, there are themes of ego and person personality," he said. "You see the Doctor struggle with who he is, and whether the life li he leads is an accurate expression of h his spirit. And I also think there's a d deeper well of love in the show now, n that was only touched upon in the earlier shows. I think the Doctor Do loves Clara in a very deep way that is not just about romance, so it goes into deeper territory of affection." This was echoed by Coleman, who said this season would see a change in their relationship. "Clara's going to struggle to make the Doctor dance to her tune, absolutely: and I think that's what's really interesting, because this Doctor is someone who doesn't like to dance as much. "She struggles with him and he's a lot more of a handful for her. He has a kind of mad curiosity that pushes him to different limits and really tests her, so I think it's not easy, but they are bound together still." Capaldi admitted that a little of Malcolm Tucker, his foul-mouthed political aide in satirical series The Thick of It, had crept into his Doctor, meaning he was a little more "edgy, volatile and dangerous". He added: "Yes, I think there's a certain acid wit that they share, though clearly there's no bad language. I think Malcolm would be incredibly envious that his alter ego, me, had got this gig and didn't have to spend his time dealing with idiot MPs." Despite a "damaging mistake" in July that saw the script and footage for the highly anticipated series leaked online, the nationwide anticipation remains undimmed, and Moffat said it was still "absolutely phenomenal" to witness the fans' response to the screening. "To be perfectly honest, I write it largely to entertain me," he said. "And sometimes, because the Doctor now happens to be a fellow Scotsman of roughly my age, I write to entertain Peter." APA 6th ed. : (2014-08-08). Daleks, cybermen and army of earthly fans turn out for Capaldi spin on Doctor Who. The Guardian p. 3. MLA 7th ed. 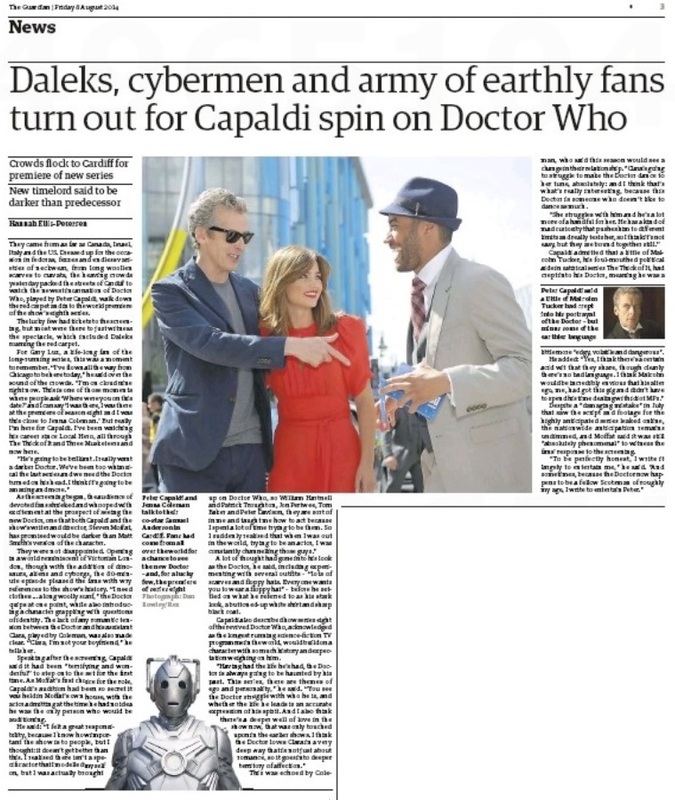 : "Daleks, cybermen and army of earthly fans turn out for Capaldi spin on Doctor Who." The Guardian [add city] 2014-08-08, 3. Print. Turabian: "Daleks, cybermen and army of earthly fans turn out for Capaldi spin on Doctor Who." The Guardian, 2014-08-08, section, 3 edition. This page was last modified on 9 August 2016, at 01:50.